Think back to when you were in grade school. Did you ever feel like you wanted to save the world, but didn’t know how or where to begin? How might we use gamification to help kids create social impact through long-term personal change? Explore the ideation process by creating a mobile app or game that uses some aspect of gamification to create positive behavior change. Good Aim is an augmented-reality game that encourages high school students to learn about and donate to local non-profits while exploring their community. Players can find monsters in their neighborhoods and battle the creatures with a slingshot. Monsters represent local community problems related to education, healthcare, the environment, and more. Boss events let you team up with your neighbors to defeat larger community monsters together in real time. Players can visit virtual charity shops and "purchase" rare ammo with game coins collected after defeating monsters. While in the shop, players learn about the charity and the problems actually facing their neighborhood. They can then make a donation pledge to that charity. And donating to local charities responsibly. We were constrained by the Apple Store's policy of not collecting donations on behalf of non-approved charities. So instead, we encourage donations through a pledging system. This allows micro-donations and has the added benefit of parents monitoring how much money is spent and where. We first began research by looking at random acts of kindness as our behavior to change. However, it was suggested we broaden our scope to not become too narrowed too early in the process. This feedback proved critical to the journey of our project. Had we not considered other areas of related behavior change, we might have missed out on the idea that turned into Good Aim. A visual summary of the research we conducted over the course of the project. We covered altruism theory, behavior change theory, and game design. Charity begets happiness. The charity happiness cycle describes that happier people give more monetary donations, and because they’ve donated, they feel happier. Encourage community play. Social learning theory, a behavior change theory, explained that people will learn new behaviors by imitating their role models. 3. Avoid donations motivated by reward. The overjustification effect occurs when external motivators to be altruistic crowd out internal motivators. We, and others in our cohort who offered feedback, felt there was a moral obligation to make sure that donations were not being directly motivated by in-game rewards. 4. Avoid saving the world, focus on local impact. We found that scope insensitivity, also called scope neglect, occurs when the scope of the action, or the number of people helped by an action, has little effect on the amount someone is willing to donate. After generating more than 40 ideas, we plotted them on a 2x2 matrix which we found useful in understanding our desired opportunity space - improving a behavior through individual play. Next, we conducted a concept analysis. Based on our rankings, we narrowed to our top 18 and subsequently our top 3 concepts (highlighted in yellow). However, we ran into a viability problem with our highest ranked idea (highlighted in gray). In the end, we settled on including the Hangman-style game as a stand-in concept. Players take turns challenging others to complete an act of kindness. Each player must then perform the act before the timer runs out. If the act is not completed, the failing player’s island will sink a little deeper into the ocean. After volunteering, log your working hours in the app. As you gain more hours, your planet will grow from a bleak desert land into a wonderland full of vitality. You can swipe and zoom in to check out your friends’ planets, and see your ranking among friends on the leaderboard. 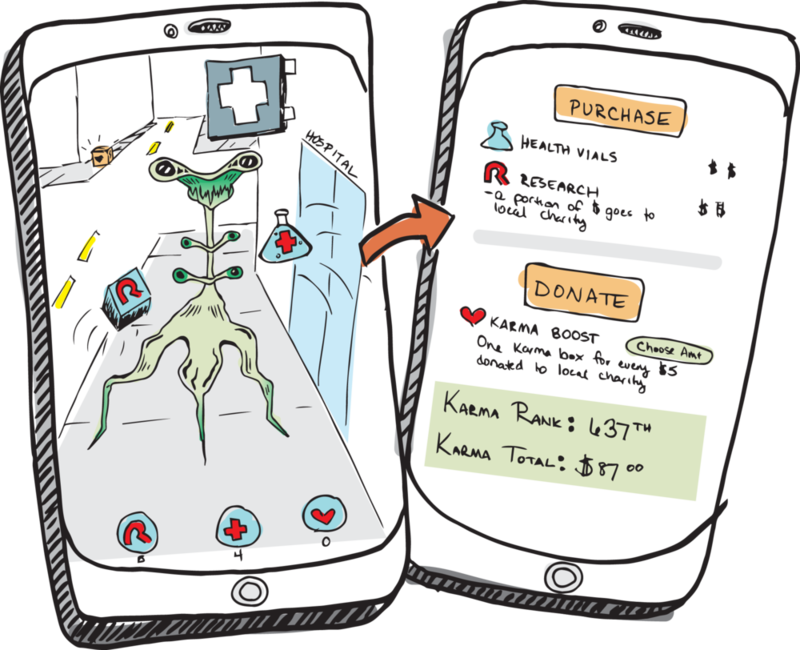 Make micro-donations in the augmented reality world to turn virtual creatures back into humans! Search for virtual creatures and scavenge for treasure items. Battle creatures and turn them back into humans. We did a Six Hats critique and picked the AR charity game as our top idea! We used the charity happiness cycle as inspiration for aesthetic direction. Our team wanted a cheerful and playful aesthetic in hopes of promoting players’ donation behavior. This helps increase player retention rates and creates a positive impact on the mental & emotional lives of players. Creatures and ammo represent problems local charities hope to overcome. For example, players will have a higher chance of encountering healthcare monsters and bosses depending on how close they are to charity shops tied to healthcare-related non-profits. This design decision reflects our hope of putting a face to the challenges communities face while making the challenges feel surmountable. Players bring color to their game world by unlocking charity shops. In order to figure out the world players would find themselves in, we did a storytelling session. After reading each story out loud and discussing, we concluded that there should be a concept of “lighting” a gray world as a player visits a charity. This is directly reflected in the design of our city buildings. Wireframe numbers correspond to specific points in the the interaction flow.